We did it again! Another issue completed and it’s beautiful. Our cover shot this time is of St. Paul, Minnesota, bathed in hazy golden light late on a September afternoon. Editor Kathleen Cassen Mickelson lives in the Twin Cities and is delighted that co-editor Constance Brewer, who lives in Wyoming, liked the idea of using this image. More important is what’s inside: 35 poets from a host of places who share images in words, craft reactions to the world as it is right now, remember other places and people, and ponder how life has turned out. These are strong voices and our pages are nearly bursting with their force. Intrigued? Then find your favorite version of this issue below and read on. Share us with your family, your friends, your neighbors and co-workers. 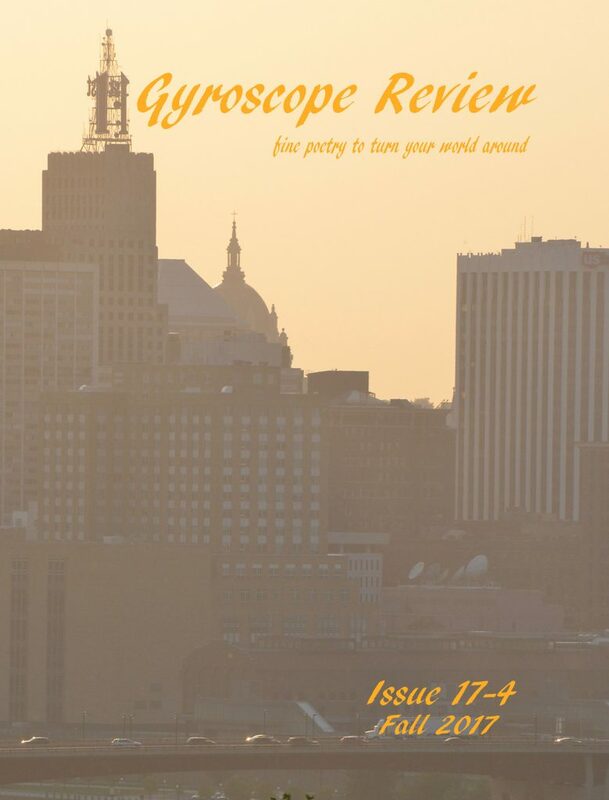 To purchase a print edition of Gyroscope Review Issue 17-4 on Amazon, click HERE. Gyroscope Review print editions are also available on Amazon. Next:Next post:The Underground is Coming Up!